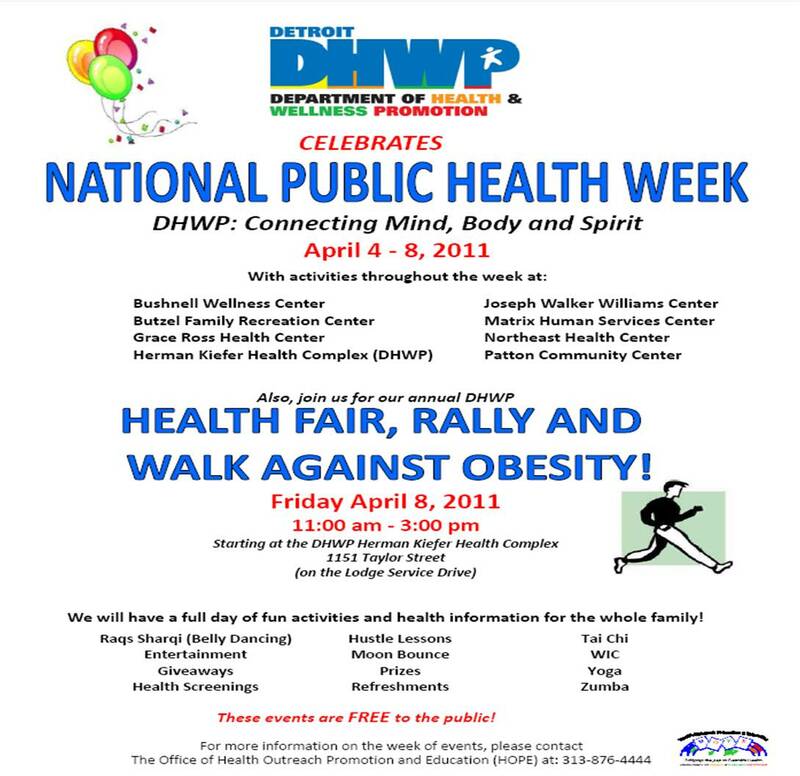 DETROIT — The Detroit Department of Health and Wellness Promotion (DHWP) will observe National Public Health Week at the Herman Kiefer Health Complex starting Monday, April 4, 2011. This year’s theme is “Connecting Mind, Body and Spirit.” During the week several activities are planned throughout the city of Detroit. The observance will begin with an official welcome and “Hustle for Health” dance session in the Herman Kiefer Health Complex Byron lobby, followed by a healthy snack free for the community. Additionally, community health activities will be conducted at selected Detroit recreation centers and community health centers where DHWP will provide services that directly address prominent health issues that affect that area. 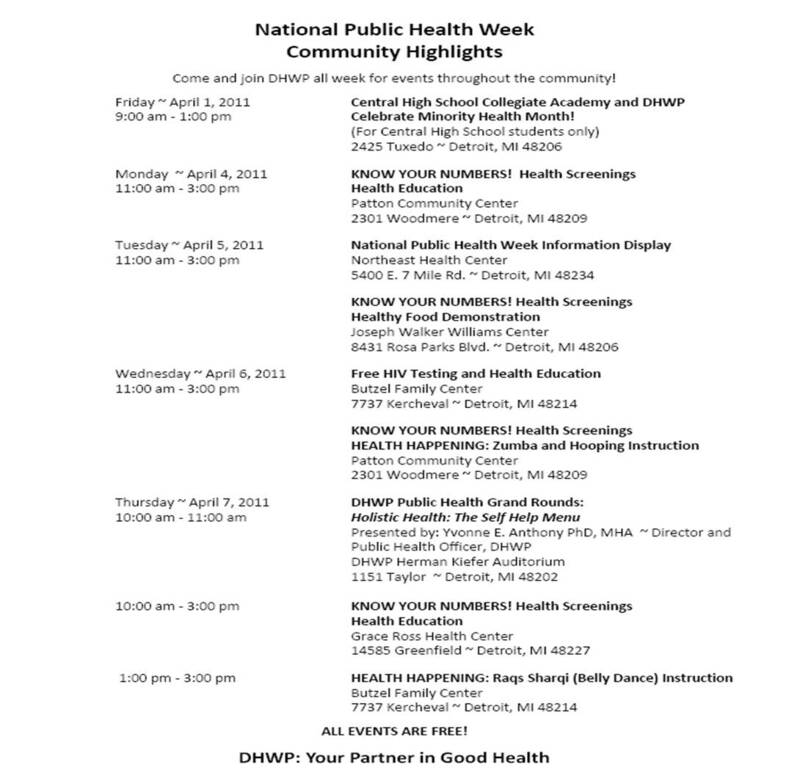 Health screenings, food demonstrations and activities will also be offered at these events. 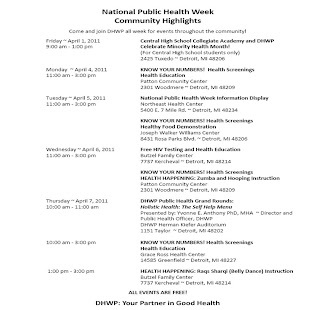 Additional highlights include a “Health Movie Matinee” on Wednesday, featuring a movie focusing on healthy lifestyles; and on Thursday a special Public Health Grand Rounds with Dr. Anthony speaking on “Holistic Health: The Self Help Menu.” This Grand Rounds topic will introduce the holistic approach to public health to the community. The week, filled with health education activities, will culminate on Friday, April 8 with a “Walk Against Obesity” - lead by Dr. Anthony - that will include the participation of not only various DHWP program staff but local walking clubs, businesses and community organizations. A rally and lunch-and-learn health fair will begin immediately after the walk. 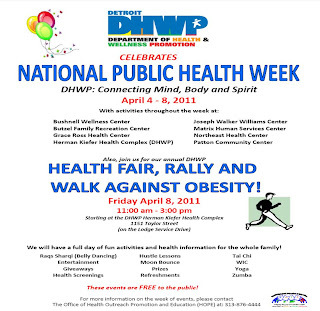 The health fair will highlight all DHWP programs and services. The fair will feature organized activity stations that promote healthy lifestyles and physical activity. Here, health passports can be stamped at each station and can be redeemed for a chance at a grand prize drawing. After the rally, a special food demonstration and presentation will be given during the lunchtime hour by the celebrated, non-profit Detroit food program, Urban Farming and its founder, Taja Sevelle. For more information, please visit www.detroitmi.gov or call 313-876-4444.